The Wikimedia Report Card is the result of the analysis work done on the metrics of the WMF. When you read or know about its history, you will agree that it takes considerable effort to produce relevant information. In the data for the report card only the 25 biggest projects are considered and, the number of editors is de-duplicated to allow for people who contribute on multiple projects. The one thing missing in these numbers is Wikidata as a project. It is missing because it should already be the number 5 in the list of active editors. Like Commons, its user base should be considered because many people join Wikidata as their prime project. 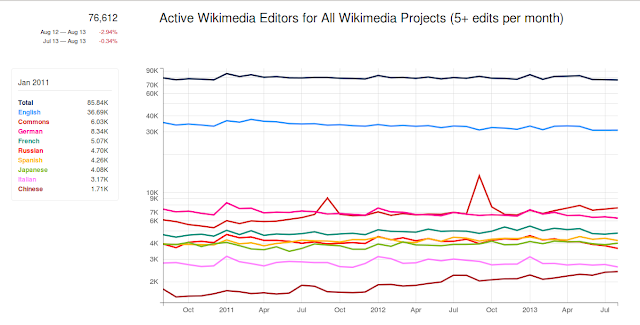 There are other reasons to consider Wikidata as well. The aim of the WMF is to share in the sum of all knowledge and arguably, Wikidata is more representative off all knowledge than Wikipedia. Combine Commons to illustrate and Wikidata to provide facts on all items of knowledge and you have the basics for information dissemination in any language. Another aspect of Wikidata is that it knows implicitly about Wikipedia and its coverage. Combine Wikidata with the accumulated traffic data for a subject and it will be known what the English reading public is missing out on. It will be a great improvement when the report card does recognise Wikidata for its success. The number of active editors is probably fairly easy to fit in.